We know professional development is important. 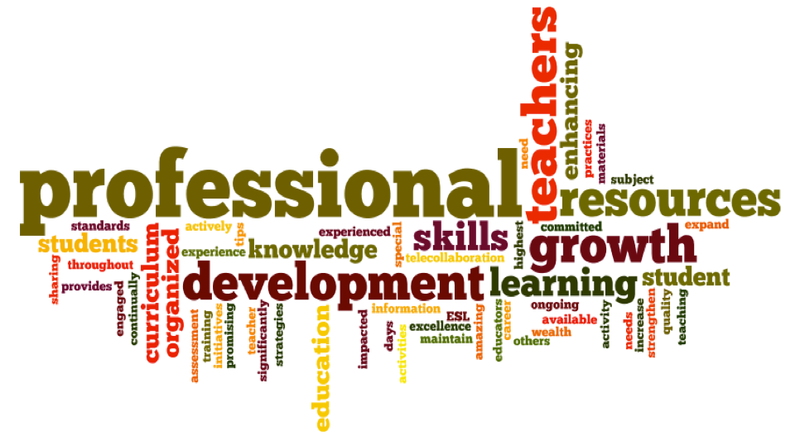 We know that professional development is often perceived as a colossal waste of time. We also know that most professional development is "sit and get" and/or designed to try to introduce a general topic for all teachers, regardless of grade level or content area. And we know how those models contribute to the perception that most scheduled PD is a colossal waste of time. Why have we been so reluctant to introduce changes? In this Gates Foundation report, "Teachers Know Best: Teachers' Views on Professional Development," one specific sentence rang particularly true: ". . . professional development is viewed more as a compliance exercise than a learning activity—and one over which they have limited, if any, choice" (p. 10). I met with some administrators and teachers recently. We talked about administrator expectations for professional development. Post-meeting whispers were that teachers just wanted to know what they needed to do to be compliant so they could get back to teaching. For educators, time is always an issue, whether it is enough time to plan, enough time to provide the kind of support teachers really need, or enough time for the actual professional development teachers need and want. The Fifth Discipline (1990) caught the attention of business leaders and managers around the world and prompted conversations about what it means to be a learning organization. Senge describes learning organizations as "organizations where people continually expand their capacity to create the results they truly desire, where new and expansive patterns of thinking are nurtured, where collective aspiration is set free, and where people are continually learning to see the whole together" (p. 3). The five disciplines Senge elucidates are: systems thinking, personal mastery, mental models, building shared vision, and team learning. You can find a more detailed overview of Senge's work here. What is interesting, however, is how erratically a school, an organization designed for learning, is so rarely a learning organization, even a learning culture. Sure, this language and this work is generally geared towards businesses, but certainly there is room for seeing and applying the parallels. The learning experience for teachers is much like the learning experience for students. Students don't want teachers talking down to them and teachers want to be treated with professional courtesy. Students generally appreciate hands-on learning so they can make sense of the learning and figure out how to apply to what they already know. Teachers appreciate interactive and hands-on professional development so they can make sense of the PD experience and begin to think how they might adapt it for their students. The comparative list goes on. An essential element of any learning experience is relevance. Just now I'm fortunate enough to be doing some work with Discovery Education as an instructional coach. In my opinion, a good instructional coach doesn't waltz into a building and start making recommendations. Rather, a good instructional coach listens attentively and asks clarifying and probing questions. When a relationship is established and the coach has a sense of direction for the teachers with whom she or he might be working, then stuff can happen. Establishing a working relationship really doesn't take long, but developing and implementing an instructional coaching plan that makes sense does take time. For coaching to be effective, teachers and coaches must work together over time. For any professional development to be effective, it must be targeted and cannot be implemented as a "one and done." As I've said before and as many have said before me, there is no secret sauce and no magic bullet for successful professional development. And, furthermore, just as one-size-fits-all learning isn't ideal for students, one-size-fits-all professional development is ludicrous for teachers. Sure, there may be some workshops that can be generalized for teachers of all grade levels, content areas, and years of experience. But new/er teachers have different needs than struggling teachers who have different interests than more experienced teachers. There are few PD providers who are surprised when some number of teachers schlep in a bag full of stuff, settle in the back, and do their own thing. Those are the folks who readily and shamelessly communicate that this PD event is a waste of their time. Every now and then we might be lucky enough to have one or two of those individuals set aside their grading, planning, or whatever else they're doing to pay attention. That's when we know we've touched on something of interest even to those who think (and often are) more skilled. Unfortunately, most educators--and we knew this before the Gates Foundation published this report--do not get the professional development they need or want. Why? Time, money, expectations. There isn't enough time, there isn't enough money (to pay for substitutes or to pay a stipend if teachers stay after school or come on a weekend), and administrator expectations are often unrealistic about the kind of impact a single PD event might have. You know how students will rise or fall to the level of expectations we have for them? The same is true for teachers. If they think the administration thinks they're mediocre, they will have no incentive to try to improve. They are likely to figure their administrators are unlikely to change their minds, so why bother? Which brings me to growth mindset. Carol Dweck and her colleagues have brought to our educational consciousness the concept of growth mindset which posits there are individuals who "believe that their most basic abilities can be developed through dedication and hard work—brains and talent are just the starting point" and, more importantly, that growth mindset can be taught. Instructional leaders and administrators who accept the theory of growth mindset realize the intrinsic and extrinsic motivations that keep teachers striving to improve. They also acknowledge that those teachers with a fixed mindset are the individuals to whom they need to give different support and attention. There are ways that "[l]eaders can work to cultivate a growth mindset" and, I believe, a culture of growth mindset in their schools. But teachers don't have to wait on their leaders. They can begin to make those changes on their own each time they make an incremental change in their instructional planning and practice that makes a difference for their students. While teachers should keep communicating to their administrations when professional development is insufficient, inappropriate, and/or unsatisfactory, they cannot rely on complaining. They also have to be willing to make and take the time to build a realistic professional development plan. And they have to be willing to continue to ask for help and for support. Administrators can find ways to fund initiatives that are going to make a difference for the students and their learning. As an instructional coach, one particular frustration is the teacher who willingly accepts feedback and acknowledges a change could be made but wants to wait until the start of a new school year. While we all want to start a new school year with renewed energy and commitment, there is no reason to wait to start professional development. If we want to model the importance of learning and the value of teachable moments, there is no time like the present to draft that professional development plan and start working on some goals now. For one of many possible ways to develop a professional development plan, check out my resources here. If you see anything you like and want, send me an email and I'll get the documents to you.